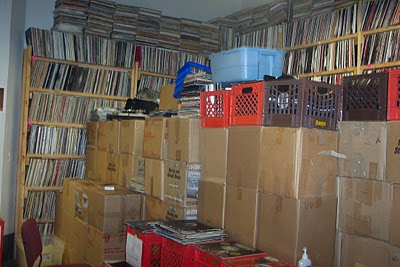 Metrowax Records Blog - Vinyl Record News and Tips for DJs and Collectors: Are You A Record Hoarder? Are You A Record Hoarder? Some of the records we are hoarding. Are you a record hoarder? Record collecting can be addictive. You start out just buying a few albums from your youth at the local book and record store, but quickly you become tired of your limited selection. Since you never get rid of anything, your stacks just keep getting bigger and bigger as you buy more and more records, often taking chances on something you barely have heard of just because it's on vinyl. Record collecting is a passion, but it can become a sickness as your records dominate all of your available space, forcing your significant other to give you an ultimatum: "The records must go, or I will!" Would any of you classify yourselves as a record hoarder? We are curious and would love to hear your plight. LOL. I just read this. This is no exaggeration, my mane Wade has piles and stacks and palates of undiscovered hoarderific wax. Gradually this collection gets listed, and as it does I am keeping tabs on the joints that get dropped. Thank God for hoarders. I just found a batch of pretty interesting records today while digging in our office. I will probably hoard them for awhile, as usual. I used to be a CD hoarder, which is a lot easier to manage. I've learned my lesson and now that I'm collecting records again I have a simple rule when I buy: All killer, no filler. Quality not Quantity. Yup, guilty. My wife is into it as well but she is happy sorting thouugh my records rather than getting them on her own. I have 4000 45rpm records and counting. How much space can one little 7 inch 45rpm record take up? After i bought against your site however adding desire only marginally touch submits. Exciting IPVA 2019 visite Licenciamento Anual way of permanent, Soon we will be book-marking each time get hold of styles entire can come in place.